1. Click the Submit button. 2. Portfolio & Page: In the first section of the "Submit Portfolio" page, you will see an overview of which portfolio and section you are submitting. 3. 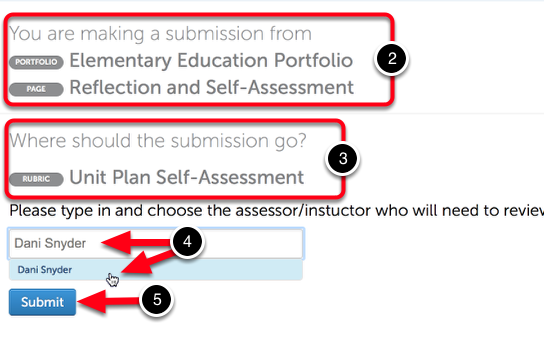 Assessment Instrument & Assessor: In the section section of the "Submit Portfolio" page you will see which rubric you are submitting to, and which assessor will review your self-assessment once you have completed it. NOTE: If there are multiple instruments linked or assessors available, you may be required to select the instrument and/or type in the assessor's name. 4. Enter the name of the assessor/instructor who will review your self assessment. As you type, their name will appear in a drop-down menu. Once the name has been selected, it will appear next to a checkmark. 5. After making the appropriate selections, click Submit.